Disaster Studies M.A. program began in Fall 2016. Like other newly opened graduate study programs, this MADS program needs promotional activities in order to attract new students. Keeping the urgent need in mind, Dr. Kyne who received permission from Dr. William Donner, Coordinator of the MADS program, grasped an opportunity to participate in the Graduate Fair Event 2018 (Edinburg) organized by the Graduate College, The University of Texas Rio Grande Valley (UTRGV). 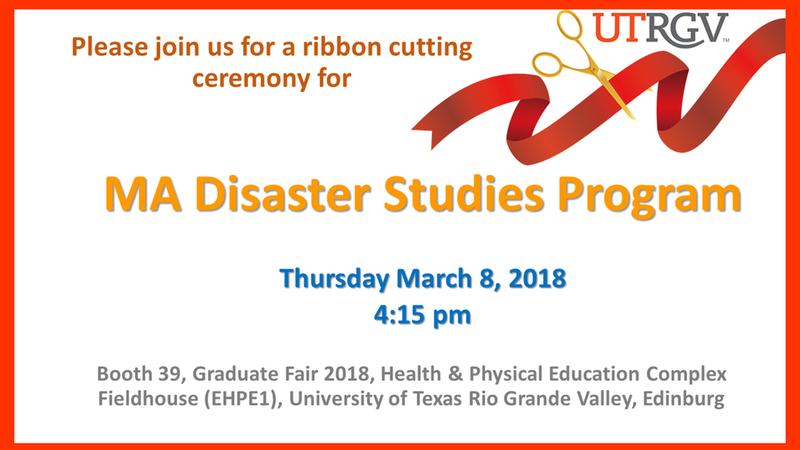 The event was held from 4:00 pm to 7:00 pm on March 8, 2018, at the UTRGV Fieldhouse, N 5th Ave, Edinburg, TX 78541. A ribbon cutting ceremony was held at the exhibition booth in order to mark a grand opening of the newly offered MADS graduate study program. a group of six volunteers who worked in different positions serving the visitors at the booth. The exhibition lasted 180 minutes (3 hours) from 4:00 pm - 7:00 pm. 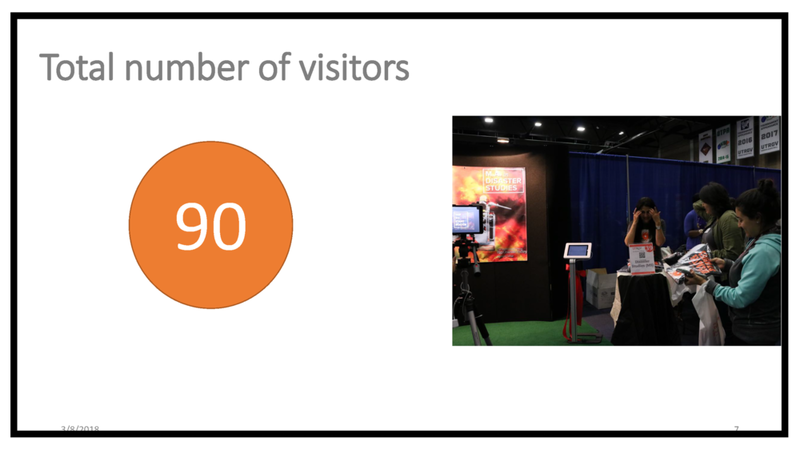 On average, there was one visitor at the booth every two minutes (a total of 90 visitors). 70 out of 90 registered using an online registration form provided via two iPad Kiosk stands. Visitors also completed the registration form on their smart phones. 47 out of 70 expressed their intention to apply for admission to the program. "Wow. All our programs need a Dean Kyne! You did an outstanding job last night. Everyone I spoke with was in awe of the sophistication of your booth. College of Liberal Arts, Dr. William Donner, Director, MA Disaster Studies program, and Dr. Ramon Guerra, Chairperson, Department of Sociology and Anthropology. 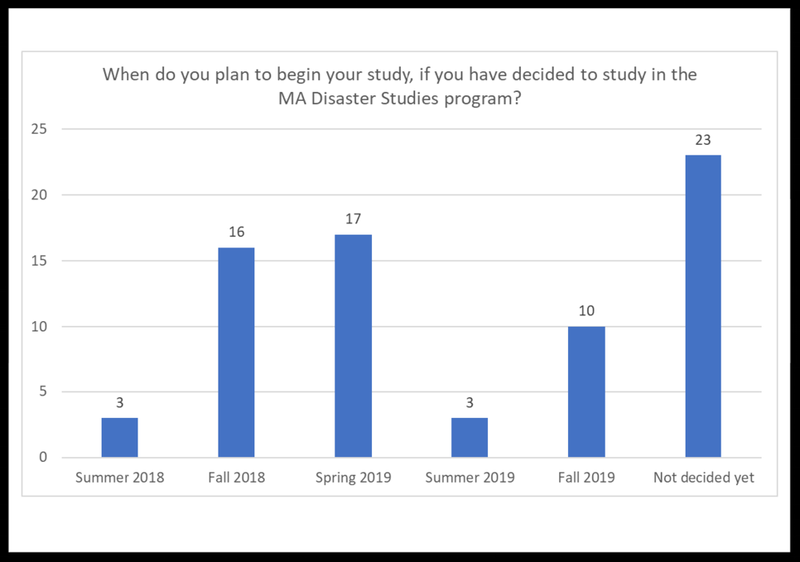 A photo, which was produced on the fly by the popular photo booth being portrayed with MA Disaster Studies Program information!